A federal agency voted to kick off the repeal of "net neutrality" rules designed to keep broadband providers like AT&T, Verizon and Comcast from interfering with the internet. It's the latest change that the Federal Communications Commission has made to ease regulation of the phone, broadcast and cable industries. Undoing the net neutrality rules—which, for instance, block providers from favoring their own apps and services over those of competitors like Netflix—may be the biggest battle yet triggered by FCC Chairman Ajit Pai. The tech industry, which sees net neutrality as necessary to innovation, is already pushing back by lobbying politicians, sending letters of protest to the agency and starting to rally supporters. The FCC's three commissioners voted 2-1, with the lone Democrat opposed, to start a process aimed at unwinding the net neutrality rules. It will be months before final rules are up for a vote. 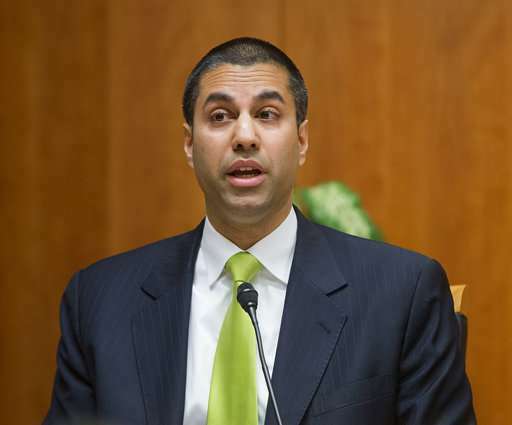 Pai often argues that net neutrality rules are heavy handed and discourage broadband investment. His goal, he says, is to encourage companies to build out their wired and wireless broadband networks and draw more Americans online. For support, Pai turns to a study by Hal Singer, a net-neutrality critic and economist who has worked as a telecom-industry consultant. Singer found that such infrastructure investment by network companies has declined 5.6 percent in 2016 from 2014. The telecom trade group USTelecom likewise says broadband investment is falling in the aftermath of the net neutrality rules. Free Press, an advocacy group that supports net neutrality, has its own competing study showing broadband companies' infrastructure spending rose, and says USTelecom is wrong to exclude some spending by AT&T and Sprint. Pai on Thursday defended the analysis he relied on, saying it's the more accurate measure of investment in the U.S.
Industry analysts, however, say it's so far hard to say, and note that other factors also affect investment. In June 2015, the Obama-era FCC decided to regulate broadband as a "Title II" service—putting it, like phone service, under stricter government oversight. That gave the FCC authority to enforce net neutrality rules. Companies worried that regime would make it easier to regulate the prices they charged for broadband. "From where we sit, the overall level of investment in the business is still pretty strong," said Moody's Mark Stodden, who analyzes telecom companies like Verizon and AT&T. "I hear companies complaining about net neutrality and Title II, but I think it's a cop-out. I don't think they're actually spending less. They don't like it so they complain about it." Some net-neutrality supporters have already started to push back against the repeal effort. The Firefox browser has a call to action that goads users to "tell the FCC that you heart the open web!" and links to a site collecting signatures for a letter to Pai. John Oliver, the HBO comedy-news host whose 2014 segment helped popularize net neutrality as an issue (nearly 4 million comments filed back in 2015), got into the mix again with another segment on May 7, urging viewers to tell the FCC to keep the net neutrality rules. But the vitriol often unleashed by the internet is already leaking into this inter-industry tech-policy battle. The chairman and his staff have complained about mean or racist comments directed at Pai, who is Indian-American. Oliver even begged supporters to be civil in an online video posted Sunday. There are also reports that many of the 2 million comments already filed to the FCC are fake. And the FCC said its site was attacked the night of Oliver's first segment, making it hard to leave a comment. FCC officials have said, however, that it's not a numbers game, and they pay more attention the know-how of the person or group making the comment rather than how many are filed on each side. Big broadband companies say they can be trusted to do what's right for their customers. Net-neutrality advocates cry foul; Free Press has a list of what it calls net-neutrality violations going back more than a decade. "An open internet means that we do not block, throttle or otherwise impair your online activity," said a Wednesday ad in the Washington Post placed by the cable lobby, NCTA. "We firmly stand by that commitment because it is good for our customers and good for our business." "Verizon supports net neutrality. Our customers demand it and our business depends on it," wrote Craig Silliman, Verizon's general counsel, in a post on LinkedIn. He also called for net-neutrality legislation from Congress. In an April blog post, AT&T says it "has always supported our customers' right to an open internet—and the right to access the content, applications and devices of their choosing." AT&T and industry trade groups sued the FCC over the 2015 rules; a federal appeals court upheld them in 2016 . Verizon sued over a previous attempt that was spiked in 2014 by a federal appeals court. We already pay more for internet access than most countries and our service is generally slower. We need to keep the neutrality on the net.